Please try entering https://graph.facebook.com/321509324688791/photos?fields=source,link,name,images,album&limit=200 into your URL bar and seeing if the page loads. During this past summer the Calvert football team participated in a week of service. It all started with a tremendous opportunity in which twenty plus young men picked over 14,000 pounds of corn for the Farming 4 Hunger campaign. Farming 4 Hunger is a community driven organization developed by Bernie Fowler Jr. to help feed those who need and teach a community to live and sustain off the land. After the harvest our young men took time to break bread together and listen to the humbled beginnings of now a very strong young man. Teon Plater poured into our guys, illustrating the consequences of poor decisions and the dire need of faith and family to rise above it. Then on the evening of July 23rd the Calvert Football Team Contact Camp began at a new venue in hopes to tie football and community together. For three nights young ball players and families from all over Southern Maryland basked under the setting sun while looking over the Serenity Farm of Benedict, Md. onto the Patuxent River. Meanwhile Cavalier coaches and players lead, motivated, encouraged and shared in a one of a kind camp experience for over 110 campers. Each night featured a special treat for the campers and their families. This included the most delicious watermelon of the season that was provided and served by Southern Calvert Baptist Church to all campers, coaches and counselors. The Director of the Southern Maryland Fellowship of Christian Athletes Bill Berghoefer delivered stacks of FCA’s very own magazine for each camper and coach present. The magazine that each camper left with featured Clemson University’s QB stand out Tajh Boyd; while each youth level coach received a magazine that featured Ole Miss head ball coach Hugh Freeze. Then as if Farming 4 Hunger and Bernie Fowler hadn’t done enough already they blessed each parting family with a bag of produced served directly from the farm. Of course special t’shirts were handed out to each camper and was worn by each coach, staff member and counselor that celebrated our location, purpose and theme. Mrs. Debbie McIntosh of Mcintosh Images used her creative eye to capture the memories of the entire 2014 experience. Finally on Saturday, the camp culminated with a family and fan festival. Music from DJ Coach Hicks fill the air and added extra excitement to the as he announced each of the nine age groups represented. Then a community of football players from all ages participated in a mini combine created by our Calvert football players, while families and friends cheered on and enjoyed the blessings of the day. Then lunch was served and each in attendance received a sampling of corn and french fries made from potatoes taken straight from the farm. Of course several of our coaches pushed through the heat of the grill to masterfully prepared burgers and dogs for everyone. Mrs. Moo’s ice cream made an appearance from Spider Hall farm and each camper received a couple of scoops of delicious ice cream. 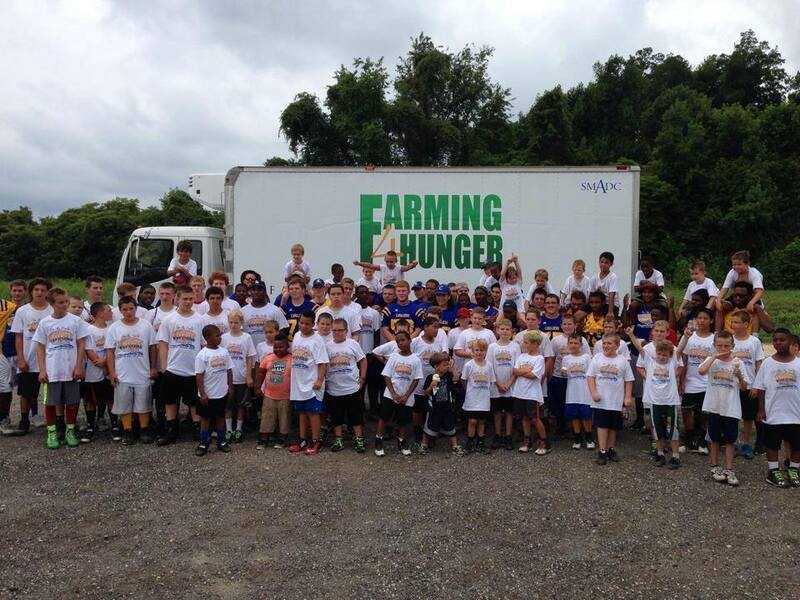 Shortly after the ice cream line down and week of great times and family fun came to a close, many of left over coaches, counselors and campers posed for the final photo of the week in front of the Farming 4 Hunger refrigerated truck. Looking back I think we all realized that football, fun, farming and food all kind of go hand in hand. However we also realized that family and faith also play an important role in our daily lives. Surely it is possible to have football, fun, farming, food, FAMILY and FAITH, all at once. Thank you for all who came, played, served and loved. From the Cavalier football family to yours, God Bless!